Can you imagine the joy of waking up to the Escondido morning sun and not having to wear glasses or contact lenses during the day? It would free you up for a host of activities that you may otherwise avoid because of your need to wear glasses or contact lenses. Most people are familiar with the many types of surgical refractive procedures but the safest and very first procedure is still relatively unknown. The first refractive procedure is called Orthokeratology. This was invented in 1955 by Dr.Charles May, an optometrist in San Diego. Interestingly, most optometrists in San Diego (and the rest of the country) are not able to provide this service to their patients. The reason for this is that these lenses are definitely the most sophisticated and difficult to design. Orthokeratology is done by using a gas permeable contact lens. The contact lens is only worn during sleep and as you sleep it gently reshapes the cornea. In the morning upon awakening, the contact lens is removed and with the new molded shape of the cornea from the previous night's wear, your distance vision is clear for the entire day without glasses. New technology is allowing us to not only treat nearsightedness (myopia), farsightedness (hyperopia) and astigmatism but also close reading problems (presbyopia). Lenses have to be worn as retainers, but some patients may only need to wear the lenses a few times a week to maintain good vision. Orthokeratology gives the same effect as LASIK without the surgical risks and it is totally reversible. If you stop wearing the lenses your eyes will return to their original shape and prescription. For more information about Ortho –K and some informational videos please check out this website: www.nightlenstherapy.com. Orthokeratology is the best treatment for children who are nearsighted, especially if they are getting worse each year. This is because the eyes tend not to get worse while doing orthokeratology. These lenses stop progression of myopia. These contact lenses have been proven to be very safe and are FDA approved. Children who wear soft contact lenses invariably have their eye sight deteriorate over time requiring thicker and thicker glasses. 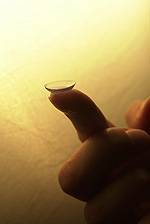 Patients do not develop eye health problems from wearing this type of lenses overnight. In the fifteen years that Dr. Karen E. Love has been designing these lenses in Escondido and San Marcos she has not had any complications. The lenses are also very comfortable. These lenses are the most complicated lenses to design and most eye doctors do not know how to design them, so they never tell their patients that this procedure exists. This is the reason why patients are not aware that this technology exists. It is a wonderful, safe and effective procedure and the patients who do it are very happy to reduce their dependency on glasses. It is particularly good for people in the desert or at the beach because they do not have the possible discomfort of contact lenses in their eyes while in these types of environments. If you or a loved one has suffered a stroke, Dr. Love at Escondido Premier Eyecare is an expert at Neuro-Optometric Rehabilitation. Book an eye exam today at our Escondido, CA eye care clinic.